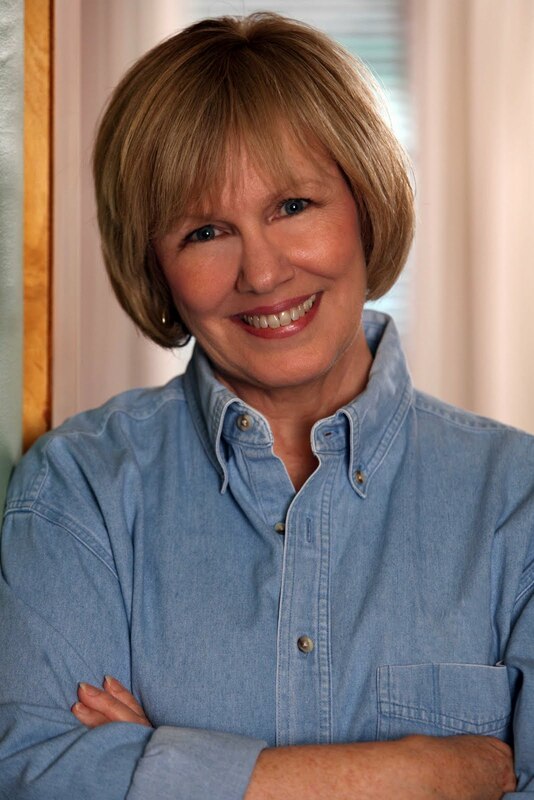 Mystery Lovers' Kitchen: Welcome, Kate Carlisle! Thanks so much to Avery for hosting me here today! Despite my excitement, I was unspeakably intimidated when I was invited to blog here at Mystery Lovers Kitchen. The reason is, I have a lot in common with Brooklyn Wainwright, the bookbinder heroine of my latest mystery, THE LIES THAT BIND. Brooklyn and I don’t like to cook. We prefer takeout. And if the takeout is provided by overly generous next door neighbors, so much the better. If I am going to sacrifice my time and effort on something that will disappear in a few minutes, it better be crazy delicious. This apple crisp is so out-of-this-world decadent that memories of each time I ate it linger in my mind. It’s addictive, and fear has prevented me from making it for at least a few years. Well, fear and the whole no-cooking thing. Now that I’ve reintroduced it to my palate, I’ve decided to feature it in the next Bibliophile Mystery. So when you’re reading Brooklyn’s next adventure and you come across the passage about the apple crisp, you’ll know that you inspired it here at Mystery Lovers Kitchen. Isn’t that fun?! In the book, Brooklyn eats it with vanilla ice cream, but I skipped that part. Only in fiction can you eat like that without gaining weight. Prepare the topping at least a couple hours before you plan to bake the dessert. Mix together the dry ingredients. Cut in the cold butter until the mixture resembles wet sand. (You can use a food processor and pulse it a few times for one second at a time.) Add the cheese and nuts and mix well. 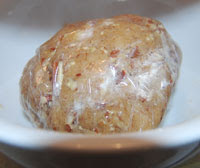 Form a ball of dough, wrap it in plastic wrap, and let it chill in the refrigerator for at least two hours. Preheat the oven to 375 degrees. Mix together the filling ingredients and put into a round or square pan with deep sides. The pan pictured here is eight inches square. Break apart the topping on top of the filling. Bake until the filling is bubbly and the top is nicely browned, about 40 minutes. While the crisp is baking, make the caramel sauce. Mix together all ingredients in a heavy bottomed pan and place over low heat. Stir frequently as it thickens. While you’re browsing the internet, I hope you’ll sign up for my mailing list at www.katecarlisle.com. You can read an excerpt of THE LIES THAT BIND, too, and get an insider’s glimpse into Brooklyn’s favorite San Francisco hot spots. Thanks for a terrific post, Kate! Great yummy recipe, thanks for sharing. Oh, my, I have got to make that recipe. It sounds wonderful! Thanks so much for sharing it. Are you sure you don't cook, Kate? This sounds just incredible! I'm trying it for sure. Good morning, everyone! Thank you for having me here today. And Avery, thank you so much for being my hostess. Before I respond to comments, I wanted to let you know about a contest I'm holding on my website. The heroine of THE LIES THAT BIND, Brooklyn Wainwright, is a bookbinder, and that's my hobby. I've taken many bookbinding classes over the years. On December 2, I'll give away a book that I made with my very own hands to a random member of the mailing list at www.katecarlisle.com. You're welcome! It was fun to make it again. I hadn't done so in a few years. And it was even more fun to eat it again. I felt like the sugar rush was going to make me swoon, but I soldiered on, anyway. After you've made it, drop me an email to let me know how you liked it! Okay - so much for the diet - although this recipe is mainly fruit, yes? What a great post, Kate. You are - as always - one of the funniest people I know. I'm still thrilled about winning a raffle prize yesterday at your launch party at The Mystery Bookstore in Westwood yesterday. As for Dumb Laws - I was surprised to discover that fireworks are illegal in the City of Los Angeles. In a city where ANYTHING goes, that's just plain silly. Hi, Hannah! Right, fruit.... yes. It has fruit in it, so that means it can't possibly affect our waistlines. Those are the rules. How about this one from Texas: It is illegal to shoot a buffalo from the second story of a hotel. I am so like you and Brooklyn, rather have someone else do my cooking. =o) However my favorite yummy holiday recipe is Almond Biscotti's that my family has made over the years. Surprisingly they are soft type of Biscotti's. Your apple recipe sounds great and i will try it. I rather bake then cook me some dinner. Haha. Crazy law i found out from a friend who was born and lives in Calvert County, MD... Calvert County MD will not let pizza hut move in due to the fact they have a red roof. The county does not allow red roofs for businesses. So poor pizza hut has to join a strip mall to sell pizza. I still haven't seen a building down here with a red roof and i have been living in this county for 3 years. I agree. Fruit is healthy! I'm in on this recipe and cannot wait to try it! Thanks for joining us here at Mystery Lovers' Kitchen, Kate. We're so happy to have you here with us today! Congrats on the release of THE LIES THAT BIND! Hi Kate - Love your recipe and very happy to see you in our *Kitchen*. :) Big congrats on the new release. Your series is so much fun! Cheers! It's illegal to shoot a buffalo from a second story window? How about from a first story window? LOL! Too funny. And yes, it's true about fruit. if there's fruit in it, no calories. Also, if you eat something from someone else's plate, zero calories.! Hi, Abby! I hope you enjoy the Crazy Delicious Apple Crisp! That's too funny that your county won't allow Pizza Hut to have their signature red roof. I guess you don't have any Red Roof Inns there, either. Seems kind of short-sighted, since you'd think they would want lots of businesses. Avery, great rule! So I can have ice cream with my apple crisp, as long as I put the ice cream on my husband's plate. Sounds logical to me!!! Hi, Kate. So glad to hear more about your writing! This weird law I love: While riding in an elevator, one must talk to no one, and fold his hands while looking toward the door. It's good to know I'm not breaking an elevator law. Yum, apple crisp! I like it with ice cream. And like you, I'm not a big fan of cooking. I do it, but I don't have a passion for it. I wish I did. Kate, that sounds so delicious! I'm going to try it as soon as I get all the ingredients. Maybe I'll eat it while reading THE LIES THAT BIND! It looks like you can cook (bake) with the proper motivation, LOL! OMG, Kate, that looks so delicious. I'm going to have to make it next week when we have company for dinner. That way there's less for me to eat *g* I'll admit it here, though - I've never had cheese on my dessert. I'm an ice cream girl. I guess I'll have to try it, though. And for an extra sweet treat, I'll eat it while curling up to read your book - I can't wait! BTW, did everyone see Kate's first comment post? She mentioned a contest on her website. Don't miss it. She makes the cutest keepsake books! Barb, LOL!!!! That has to be the strangest law I've ever heard. Crazy wet nurse on the lam! Trish, me too! It would make my passion for eating so much more convenient. Maureen, I know! I'm amazed at myself. Suffice it to say, I don't make it often. Maybe I should give the recipe to my favorite local restaurant so they can make it for me. Jen, Let me know how it turns out! I love the idea of you eating it while you read THE LIES THAT BIND. That would make me feel so special!